The alarm went off at 3.45, a second one set for 4am. At 4.45am the Club Car was scheduled to come and collect us and our luggage for the short ride uphill to the hotel reception where our airport transfer was arranged for 5am. Everything went according to plan, though an email late last evening from British Airways alerted us to the fact that the scheduled plane had technical issues and therefore our flight was to be operated by a smaller, A320 with smaller, narrower seats and fewer amenities. Oh well...it's been a fabulous week and such a small thing was not going to take that away. When we reached the carpark, a familiar figure was there, waving - Nabil, driver of the cleanest car in Jordan! How lovely to see him again - and his broad smile suggested he felt equally pleased to see us. We were soon on our way to the airport for our 8.15am flight. Once in the lounge my Hero checked the BA app to see if the flight was on time. Yes, it seemed to be, but there was another alert - a rerouting. No details, but a short while later we spotted that the flight was "via Athens". What? For now, no more details and we turned up at the gate and waited. It was soon clear we were not going to be boarding in time for an 8.15 departure. There was an air of anxiety too, as people with onward connections from London began to realise the impact of the rerouting on their travel plans. Thankfully, we had no such worries, though having been up since 3.45am, we were eager to be on our way - and of course, curious to know what was going on. We finally boarded the plane around 8.10, watching the crew chat amongst themselves. It was clear that they knew no more than we did and were also "going with the flow". We sat and waited. At 8.50am the Captain came on to say that at last, he had news for us, but that it might not be the news we were hoping for. He outlined three challenges: the first was that our original A321 aircraft had technical issues before leaving Heathrow and the A320 had been used for the outbound flight. Although the scheduled, larger-capacity A321 had been repaired and declared fit to fly, it had been sent to Beirut instead of Amman. This created a second challenge, as the A320, fully loaded as it was, could not make it as far as London without refuelling, which was why we were stopping in Athens. The third challenge was that the wrong food had been loaded, meaning that the planned hot meal would actually be a sandwich. Bearing in mind that our flight time was now listed as 7hrs 30mins and we hadn't had any breakfast, I was glad I bought a few nuts in the duty free shop! Shortly after that announcement, there came more news. Six of our fellow passengers hadn't boarded yet (this, almost an hour after the scheduled departure), so their bags were now in the process of being identified and offloaded. Ten minutes later, six people and a couple of children arrived...I guess they were lucky. Was it time to go then? 9.10am and the Captain came on the loudspeaker, sounding determined. "Just to say there are five bags on the tarmac out there and I am about to lean out of the window and shout at the man who is sitting on them!" At 9.15am the “Cabin Crew doors to automatic and cross check” announcement was made. Sounded hopeful. 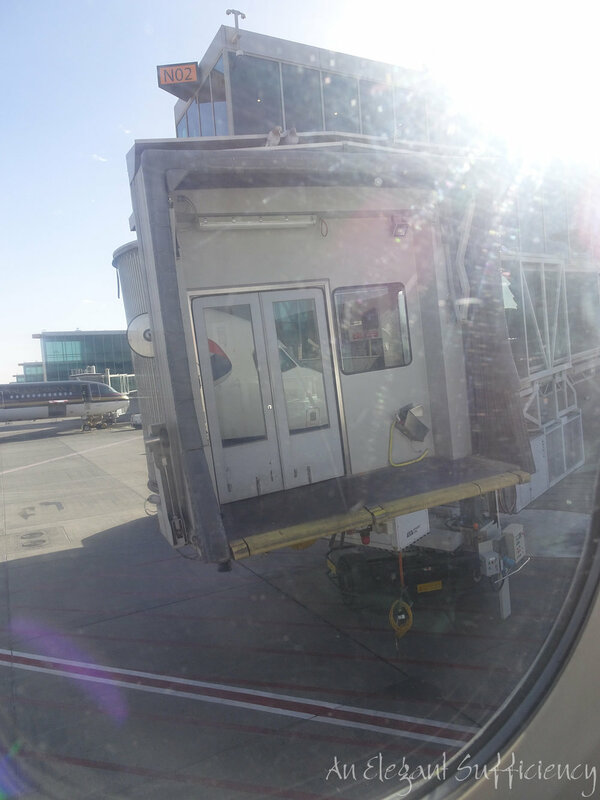 But then not more than five minutes after, we heard "Cabin Crew doors to manual and cross check". What? A weary Captain's voice announced that five buggies/strollers had been discovered at the gate, due for late loading onto the plane but as the smaller-than-expected hold was packed full with luggage already, the ground staff were proposing to leave them behind. Our stalwart Captain - quite rightly in our opinion - decided that it was unacceptable for five families to be without their pushchairs for at least a couple of days and refused to leave without them. There followed a few minutes of cabin crew doing their best to fit a quart into a pint pot before realising that there was no way either of the two remaining buggies would fit in an overhead locker. In the end, they were loaded into the flight deck and the flight crew bags were handed back to put in the overhead space instead. We had sat patiently throughout all of this parlarver, watching the staff manage a tricky situation with professionalism, in spite of their uncertainty and the same early start as the rest of us. The last straw came for one of them however, as she spotted one of our fellow passengers filming the goings on up front on his phone. Stern words were exchanged and a reminder that none of the cabin crew had given their permission to be filmed and that he should stop immediately. He grudgingly deleted the offending video. Finally, at 9.27 we heard ”Doors to automatic and cross check”. At last. Incidentally, I found out what that means when a former BA trainer spoke to my WI and explained that putting the doors to automatic activates the inflatable slide when the door is opened - putting the doors back in manual removes the slide operation so the door can be used normally again. I do like to know what these things mean! By half past nine, we were watching the safety video and pushing back, by twenty to ten we were taking off to the east and heaving a sigh of relief. We were on our way at last! We took off in an Easterly direction, flying over the desert, turning and heading towards the Dead Sea. Some two hours after we'd boarded, someone was reminded that the toilets were out of use until the fasten seat belt sign had been switched off, with the explanation that light had to be illuminated whilst flying in Israeli airspace. Shortly after crossing the Israeli coastline, the light went off and we were free to move about - though funnily, no one did! Once a cruising altitude, the Captain came back with further information and explanation. Had those buggies been left behind, they would have been loaded onto the next available flight, normally within 24 hours. But there is no flight tomorrow, so they would have remained in Amman for at least two days...possibly more. We smiled at his comment that he intended to have "stern words" with the Jordan Ground Crew! I suspect British Airways might be doing more of the same. An uneventful flight then, the time mostly spent eating breakfast - which contrary to expectations, came according to the menu we'd been handed whilst still on the ground. 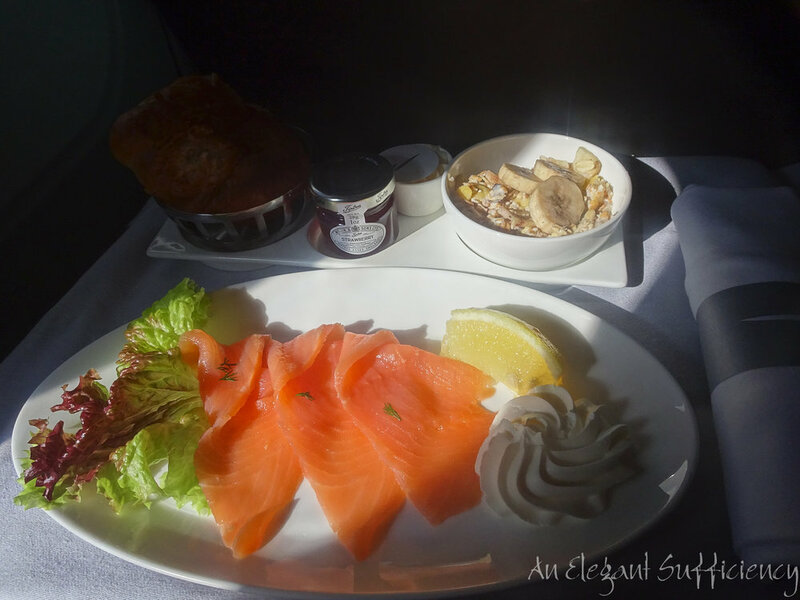 There are advantages to travelling in business class ;-) So, a bowl of well made Birchermuesli, a generous plate of smoked salmon and cream cheese, a croissant with butter and strawberry jam, followed by a plate of french toast and hot apple compote did nicely - and the cup of coffee washed down the glass of champagne I'd enjoyed earlier. No sooner had we finished and all was cleared away than the Captain was announcing that we were beginning our descent into Athens, where our stop would be as brief as possible. He planned to come through the cabin, to take on any complaints or comments, which seemed a generous gesture, since none of the hoo-hah had been of his making. In the event, we stopped, the doors were opened and the refuelling completed in double quick time and he didn't have chance to follow through on that one, but the general feeling was positive towards the actions he'd taken so far. 12.40pm and we were on our way again. Having served us our meal already, the crew had three and a half hours to keep us occupied and happy. Though it wasn’t a plane with an entertainment system as such, some means had been found to play a film on the small screen normally used for safety demonstrations, and everyone was offered headphones in order to watch it. But as I declined, I hadn't a clue what the film might be - I recognised Sandra Bullock and - I think - Helena Bonham Carter and someone else whose name I cant remember! But I am hopeless with such things and had to ask Edward and Amy later, for they would surely know. I later discovered it was Anne Hathaway and the film was Ocean’s 8, which I might actually have rather enjoyed, but never mind, I had my knitting! The flight landed around two hours late and as a result, those connecting to onward flights to San Francisco, Washington and Phoenix had missed their connection, though people travelling to Houston should hurry. We could simply make our way down to baggage reclaim and take the first four suitcases which appeared on the belt - almost as if there had been nothing else to offload! We finally arrived home shortly after 4pm, receiving a text message from Edward and Amy to say that they had just got home too. It’s been a really fabulous trip, we’ve felt very comfortable in Jordan and have had a wonderful experience.